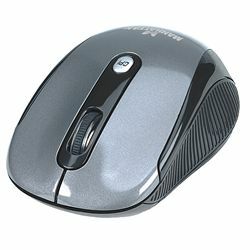 Combining a modern design with advanced precision, this full-sized wireless mouse includes a resolution button which adjusts the optical scanner from 1000 to 1500 to 2000 dpi. The powerful but inconspicuous SB receiver utilizes advanced 2.4GHz radio technology to provide an operating range of over 30 feet. When it's time to travel, the receiver fits neatly into the mouse's body. Requires Microsoft Windows XP+ or Mac OS 10.1+.